More exoplanets than expected in the first year of the Habitable Exoplanets Catalog. Image released Dec. 6, 2012. LONG BEACH, Calif. — A possible alien planet discovered by NASA's Kepler space telescope is the most Earth-like world yet detected beyond our solar system, scientists say. With a radius that is just 1.5 times that of Earth, the potential planet is a so-called "super-Earth," meaning it is just slightly larger than the Earth. The candidate planet orbits a star similar to the sun at a distance that falls within the "habitable zone" — the region where liquid water could exist on the planet's surface. Scientists say the planet, if confirmed, could be a prime candidate to host alien life. "This was very exciting because it's our fist habitable-zone super Earth around a sun-type star," astronomer Natalie Batalha, a Kepler co-investigator at NASA's Ames Research Center in Moffett Field, Calif., said Tuesday (Jan. 8) here at the 221st meeting of the American Astronomical Society. Astronomer Natalie Batalha discusses the possibility of alien Earth-like planets and what the discovery of a true Earth twin could mean during a talk at the 221st American Astronomical Society meeting in Long Beach, Calif., on Jan. 8, 2013. "It's orbiting a star that’s very much like our sun," Batalha added. "Previously the ones we saw were orbiting other types of stars." The object takes 242 days to orbit its star (compared to Earth's 365 days) and is about three-quarters of the Earth-sun distance from its parent. The Earth orbits 93 million miles (150 million kilometers) from the sun on average, a distance known as 1 astronomical unit. "It's a big deal," astrophysicist Mario Livio, of the Space Telescope Science Institute in Baltimore, told SPACE.com. "It's definitely a good candidate for life." Based on its characteristics, the possible planet may or may not be rocky, but it certainly has the possibility of liquid water. "Maybe there's no land life, but perhaps very clever dolphins," Livio joked. The possible planet is called KOI 172.02 (KOI stands for Kepler Object of Interest, a designation assigned to all planet candidates found by the telescope until they are confirmed as planets). The discovery was announced at the meeting Monday (Jan. 7) by Christopher Burke of the SETI Institute as part of a batch of 461 new planet candidates found by Kepler. Kepler finds potential planets by looking for periodic dips in the brightness of stars caused by planets passing in front of them, blocking some of their light. Astronomers have multiple ways to confirm that these candidates are actual planets, such as looking for small variations in the timing of the planets' passes in front of stars caused by the gravitational tug of other planets in the system. Kepler launched in 2009 and was recently granted an extended mission until at least 2016. The telescope has detected 2,740 candidate planets thus far. 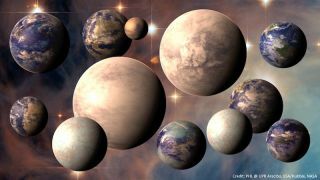 While just 105 of them have been confirmed to date, Kepler scientists estimate that more than 90 percent will end up being the real deal. "There is no better way to kick off the start of the Kepler extended mission than to discover more possible outposts on the frontier of potentially life-bearing worlds," Burke said in a statement.